The Lord of the Rings is an epic high fantasy novel written by English philologist and University of Oxford professor J. R. R. Tolkien. The story began as a sequel to Tolkien's earlier, less complex children's fantasy novel The Hobbit (1937), but eventually developed into a much larger work. It was written in stages between 1937 and 1949, much of it during World War II. It is the third best-selling novel ever written, with over 150 million copies sold. The title of the novel refers to the story's main antagonist, the Dark Lord Sauron, who had in an earlier age created the One Ring to rule the other Rings of Power as the ultimate weapon in his campaign to conquer and rule all of Middle-earth. From quiet beginnings in the Shire, a Hobbit land not unlike the English countryside, the story ranges across north-west Middle-earth, following the course of the War of the Ring through the eyes of its characters, notably the hobbits Frodo Baggins, Samwise "Sam" Gamgee, Meriadoc "Merry" Brandybuck and Peregrin "Pippin" Took, but also the hobbits' chief allies and travelling companions: Aragorn, a Human Ranger; Boromir, a man from Gondor; Gimli, a Dwarf warrior; Legolas, an Elven prince; and Gandalf, a Wizard. 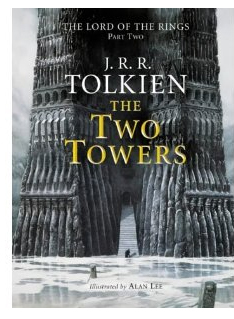 The work was initially intended by Tolkien to be one volume of a two-volume set, with the other being The Silmarillion, but this idea was dismissed by his publisher. It was decided for economic reasons to publish The Lord of the Rings as three volumes over the course of a year from 21 July 1954 to October 1955, thus creating the now familiar Lord of the Rings trilogy. The three volumes were entitled The Fellowship of the Ring, The Two Towers, and The Return of the King. Structurally, the novel is divided internally into six books, two per volume, with several appendices of background material included at the end of the third volume. The Lord of the Rings has since been reprinted numerous times and translated into many languages. The Lord of the Rings started as a sequel to J. R. R. Tolkien's earlier work, The Hobbit, published in 1937. The popularity of The Hobbit had led George Allen & Unwin, the publishers, to request a sequel. Persuaded by his publishers, he started "a new Hobbit" in December 1937. After several false starts, the story of the One Ring emerged. The idea for the first chapter ("A Long-Expected Party") arrived fully formed, although the reasons behind Bilbo's disappearance, the significance of the Ring, and the title The Lord of the Rings did not arrive until the spring of 1938. Originally, he planned to write a story in which Bilbo had used up all his treasure and was looking for another adventure to gain more; however, he remembered the Ring and its powers and decided to write about that instead. Writing was slow, due to Tolkien having a full-time academic position, and needing to earn further money as a university examiner. Tolkien abandoned The Lord of the Rings during most of 1943 and only re-started it in April 1944, as a serial for his son Christopher Tolkien, who was sent chapters as they were written while he was serving in South Africa with the Royal Air Force. Tolkien made another concerted effort in 1946, and showed the manuscript to his publishers in 1947. The story would take 12 years to finish, and would not be fully published until 1955, when Tolkien was 63 years old. 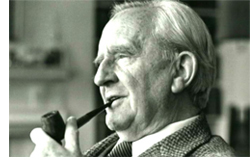 Tolkien's work has been the subject of extensive analysis of its themes and origins. Although a major work in itself, the story was only the last movement of a larger epic Tolkien had worked on since 1917, in a process he described as mythopoeia. Influences on this earlier work, and on the story of The Lord of the Rings, include philology, mythology, religion and the author's distaste for the effects of industrialization, as well as earlier fantasy works and Tolkien's experiences in World War I. The Lord of the Rings in its turn is considered to have had a great effect on modern fantasy; the impact of Tolkien's works is such that the use of the words "Tolkienian" and "Tolkienesque" has been recorded in the Oxford English Dictionary. For publication, the book was divided into three volumes: The Fellowship of the Ring (Books I, The Ring Sets Out, and II, The Ring Goes South), The Two Towers (Books III, The Treason of Isengard, and IV, The Ring Goes East), and The Return of the King (Books V, The War of the Ring, and VI, The End of the Third Age, plus six appendices). This was due largely to post-war paper shortages, as well as being a way to keep down the price of the book. Delays in producing appendices, maps and especially indices led to the volumes being published later than originally hoped - on 21 July 1954, on 11 November 1954 and on 20 October 1955 respectively in the United Kingdom, and slightly later in the United States. The Return of the King was especially delayed. 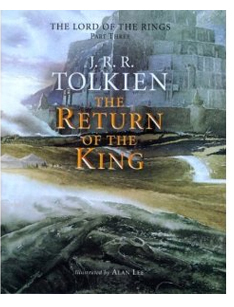 Tolkien, moreover, did not especially like the title The Return of the King, believing it gave away too much of the storyline. He had originally suggested The War of the Ring, which was dismissed by his publishers. The books were published under a profit-sharing arrangement, whereby Tolkien would not receive an advance or royalties until the books had broken even, after which he would take a large share of the profits. It has ultimately become the third best-selling novel ever written, with over 150 million copies sold. Only A Tale of Two Cities by Charles Dickens and The Little Prince by Antoine de Saint-Exupéry have sold more copies worldwide (over 200 million each) while the fourth best-selling novel is Tolkien's The Hobbit. The Lord of the Rings has received mixed reviews since its inception, ranging from terrible to excellent. Recent reviews in various media have been, on the whole, highly positive and Tolkien's literary achievement is slowly being acknowledged as a significant one. 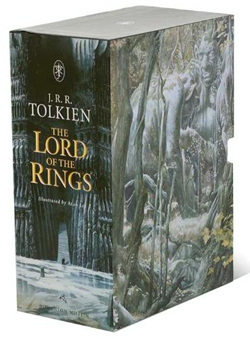 Despite mixed reviews and its lack of paperback printing until the 1960s, The Lord of the Rings initially sold well in hardback and in 1957, The Lord of the Rings was awarded the International Fantasy Award. Despite its numerous detractors, the publication of the Ace Books and Ballantine paperbacks helped The Lord of the Rings become immensely popular in the United States in the 1960s. The book has remained so ever since, ranking as one of the most popular works of fiction of the twentieth century, judged by both sales and reader surveys. 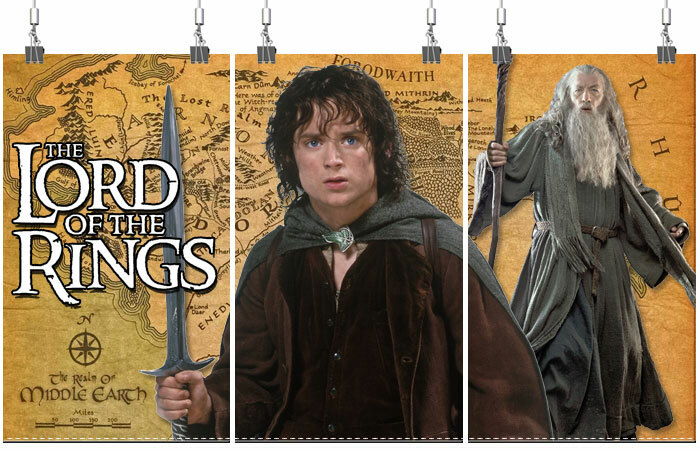 The Lord of the Rings is an epic film trilogy consisting of three fantasy adventure films based on the three-volume book of the same name by English author J. R. R. Tolkien. 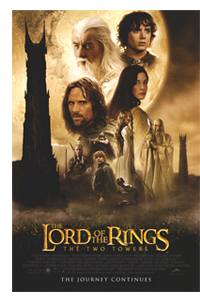 The films are The Lord of the Rings: The Fellowship of the Ring (2001), The Lord of the Rings: The Two Towers (2002) and The Lord of the Rings: The Return of the King (2003). The films were directed by Peter Jackson and distributed by New Line Cinema. Considered to be one of the biggest and most ambitious movie projects ever undertaken, with an overall budget of $285 million, the entire project took eight years, with the filming for all three films done simultaneously and entirely in Jackson's native New Zealand. 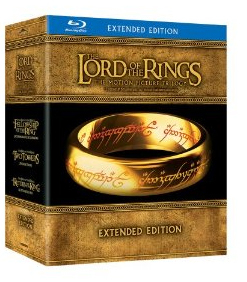 Each film in the trilogy also had Special Extended Editions, released on DVD a year after the theatrical releases. While the films follow the book's general storyline, they do omit some of the plot elements from the novel and include some additions to and other deviations from the source material. 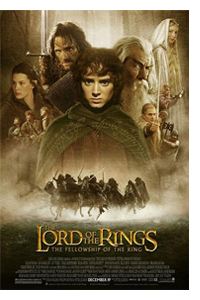 Set in the fictional world of Middle-earth, the three films follow the hobbit Frodo Baggins (Elijah Wood) as he and a Fellowship embark on a quest to destroy the One Ring, and thus ensure the destruction of its maker, the Dark Lord Sauron. The Fellowship becomes divided and Frodo continues the quest together with his loyal companion Sam (Sean Astin) and the treacherous Gollum (Andy Serkis). 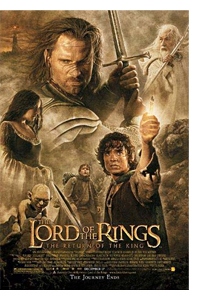 Meanwhile, Aragorn (Viggo Mortensen), heir in exile to the throne of Gondor, and the wizard Gandalf (Ian McKellen) unite and rally the Free Peoples of Middle-earth, who are ultimately victorious in the War of the Ring. The trilogy was a great financial success, with the films collectively being the sixth highest-grossing film series of all time (behind Harry Potter, James Bond, Star Wars, Pirates of the Caribbean, and Shrek). The films were critically acclaimed and heavily awarded, winning 17 out of 30 Academy Awards nominated in total. The final film in the trilogy, The Return of the King, won all 11 of the Academy Awards for which it was nominated, tying it with Ben-Hur and Titanic for most Academy Awards received for a film. The trilogy received wide praise for its innovative special and visual effects. 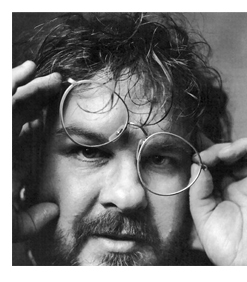 As a teenager Peter Jackson first came into contact with The Lord of the Rings when he saw Ralph Bakshi's 1978 animated film The Lord of the Rings. Years later, in 1995, Jackson was finishing The Frighteners and considered The Lord of the Rings as a new project. With the new developments in computer-generated imagery following Jurassic Park, Jackson set about planning a fantasy film that would be relatively serious and feel "real". By October, he and his partner Fran Walsh teamed up with Miramax Films boss Harvey Weinstein to negotiate with Saul Zaentz who had held the rights to the book since the early 1970s, pitching an adaptation of The Hobbit and two films based on The Lord of the Rings. Negotiations then stalled when Universal Studios offered Jackson a remake of King Kong. Weinstein was furious, and further problems arose when it turned out Zaentz did not have distribution rights to The Hobbit; United Artists, which was in the market, did. By April 1996 the rights question was still not resolved. Jackson decided to move ahead with King Kong before filming The Lord of the Rings, prompting Universal to enter a deal with Miramax to receive foreign earnings from The Lord of the Rings while Miramax received foreign earnings from King Kong. It was also revealed that Jackson originally wanted to finish King Kong before The Lord of the Rings began. But due to location problems he decided to start with The Lord of the Rings franchise instead. When Universal cancelled King Kong in 1997, Jackson and Walsh immediately received support from Weinstein and began a six-week process of sorting out the rights. Jackson and Walsh asked Costa Botes to write a synopsis of the book and they began to re-read the book. Two to three months later, they had written their treatment. The first film would have dealt with what would become The Lord of the Rings: The Fellowship of the Ring, The Lord of the Rings: The Two Towers, and the beginning of The Lord of the Rings: The Return of the King, ending with the death of Saruman, and Gandalf and Pippin going to Minas Tirith. In this treatment, Gwaihir and Gandalf visit Edoras after escaping Saruman, Gollum attacks Frodo when the Fellowship is still united, and Farmer Maggot, Glorfindel, Radagast, Elladan and Elrohir are present. Bilbo attends the Council of Elrond, Sam looks into Galadriel's mirror, Saruman is redeemed before he dies and the Nazgûl just make it into Mount Doom before they fall. They presented their treatment to Harvey and Bob Weinstein, the latter of whom they focused on impressing with their screenwriting as he had not read the book. They agreed upon two films and a total budget of $75 million. During mid-1997, Jackson and Walsh began writing with Stephen Sinclair. Sinclair's partner, Philippa Boyens, was a major fan of the book and joined the writing team after reading their treatment. It took 1314 months to write the two film scripts, which were 147 and 144 pages respectively. Sinclair left the project due to theatrical obligations. Amongst their revisions, Sam is caught eavesdropping and forced to go along with Frodo, instead of Sam, Merry, and Pippin figuring out about the One Ring themselves and voluntarily going along after confronting Frodo about it, as occurs in the original novel. Gandalf's account of his time at Orthanc was pulled out of flashback and Lothlórien was cut, with Galadriel doing what she does in the story at Rivendell. Denethor attends the Council with his son. 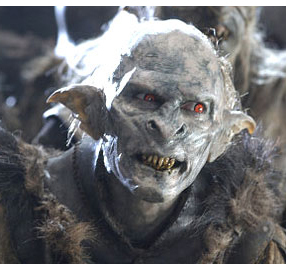 Other changes included having Arwen rescue Frodo, and the action sequence involving the cave troll. Arwen was even going to kill the Witch-king. Trouble struck when Marty Katz was sent to New Zealand. Spending four months there, he told Miramax that the films were more likely to cost $150 million, and with Miramax unable to finance this, and with $15 million already spent, they decided to merge the two films into one. On 17 June 1998, Bob Weinstein presented a treatment of a single two-hour film version of the book. He suggested cutting Bree and the Battle of Helm's Deep, "losing or using" Saruman, merging Rohan and Gondor with Éowyn as Boromir's sister, shortening Rivendell and Moria as well as having Ents prevent the Uruk-hai kidnapping Merry and Pippin. Upset by the idea of "cutting out half the good stuff" Jackson balked, and Miramax declared that any script or work completed by Weta Workshop was theirs. Jackson went around Hollywood for four weeks, showing a thirty-five minute video of their work, before meeting with Mark Ordesky of New Line Cinema. At New Line Cinema, Robert Shaye viewed the video, and then asked why they were making two films when the book was published as three volumes; he wanted to make a film trilogy. Now Jackson, Walsh, and Boyens had to write three new scripts. The expansion to three films allowed much more creative freedom, although Jackson, Walsh, and Boyens had to restructure their script accordingly. The three films do not correspond exactly to the three volumes of the trilogy, but rather represent a three-part adaptation. Jackson takes a more chronological approach to the story than did Tolkien. 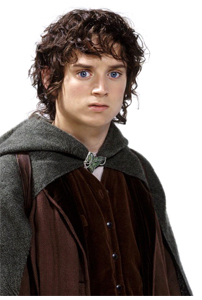 Frodo's quest is the main focus, and Aragorn is the main sub-plot, and many sequences (such as Tom Bombadil and the Scouring of the Shire) that do not contribute directly to those two plots were left out. Much effort was put into creating satisfactory conclusions and making sure exposition did not bog down the pacing. Amongst new sequences, there are also expansions on elements Tolkien kept ambiguous, such as the battles and the creatures. Above all, most characters have been altered for extra drama: Aragorn, Théoden, and Treebeard have added or modified elements of self-doubt, while the personalities of Galadriel, Elrond, and Faramir have been darkened. Boromir and Gollum are relatively more sympathetic, while some characters such as Legolas, Gimli, Saruman, and Denethor have been simplified. Some characters, such as Arwen and Éomer, have been combined with lesser book characters such as Glorfindel and Erkenbrand, and as a general matter lines of dialogue have sometimes been switched around between locations or characters depending on suitability of the scenes. New scenes were also added to expand on characterisation. During shooting, the screenplays continued to evolve, in part due to contributions from cast looking to further explore their characters. Most notable amongst these rewrites was the character Arwen, who was originally planned as a warrior princess, but reverted back to her book counterpart, who remains physically inactive in the story (though she sends moral and military support). Jackson began storyboarding the trilogy with Christian Rivers in August 1997 and assigned his crew to begin designing Middle-earth at the same time. Jackson hired long-time collaborator Richard Taylor to lead Weta Workshop on five major design elements: armour, weapons, prosthetics/make-up, creatures, and miniatures. In November 1997, famed Tolkien illustrators Alan Lee and John Howe joined the project. Most of the imagery in the films is based on their various illustrations. Grant Major, production designer was charged with the task of converting Lee and Howe's designs into architecture, creating models of the sets, while Dan Hennah worked as art director, scouting locations and organising the building of sets. Jackson's vision of Middle-earth was described as being "Ray Harryhausen meets David Lean" by Randy Cook. Jackson wanted a gritty realism and historical regard for the fantasy, and attempted to make the world rational and believable. 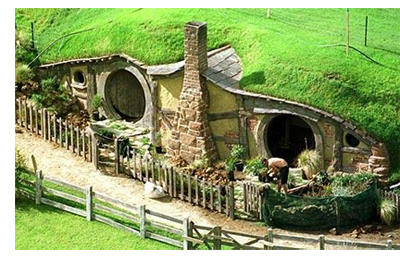 For example, the New Zealand Army helped build Hobbiton months before filming began so the plants could really grow. Creatures were designed to be biologically believable, such as the enormous wings of the fell beast to help it fly. In total, 48,000 pieces of armour, 500 bows, and 10,000 arrows were created by Weta Workshop. They also created many prosthetics, such as 1,800 pairs of Hobbit feet for the lead actors, as well as many ears, noses, and heads for the cast, and around 19,000 costumes were woven and aged. Every prop was specially designed by the Art Department, taking the different scales into account. To develop fight and sword choreography for the trilogy, the filmmakers employed Hollywood sword-master Bob Anderson. Anderson worked directly with the talent including Viggo Mortensen and Karl Urban to develop the many sword fights and stunts within the film. 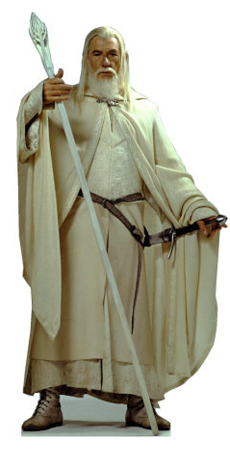 Bob Anderson's role in The Lord of the Rings trilogy was highlighted in the film Reclaiming the Blade. This documentary on sword martial arts also featured Weta Workshop and Richard Taylor, Lord of the Rings illustrator John Howe and actors Viggo Mortensen and Karl Urban. All discussed their roles and work on the trilogy as related to the sword. Principal photography for all three films was conducted concurrently in many locations within New Zealand's conservation areas and national parks between 11 October 1999, and 22 December 2000, a period of 438 days. Pick-up shoots were conducted annually from 2001 to 2004. The trilogy was shot at over 150 different locations, with seven different units shooting, as well as soundstages around Wellington and Queenstown. As well as Jackson directing the whole production, other unit directors included John Mahaffie, Geoff Murphy, Fran Walsh, Barrie Osbourne, Rick Porras, and any other assistant director, producer, or writer available. Jackson monitored these units with live satellite feeds, and with the added pressure of constant script re-writes and the multiple units interpreting his envisioned result, he only got around four hours of sleep a night. Due to the remoteness of some of the locations, the crew would also bring survival kits in case helicopters could not reach the location to bring them home in time. The New Zealand Department of Conservation was criticised for approving the filming within national parks without adequate consideration of the adverse environmental effects and without public notification. The adverse effects of filming battle scenes in Tongariro National Park later required restoration work. The first film has around 540 effect shots, the second 799, and the third 1,488 (2,730 in total). The total increases to 3,420 with the extended editions. 260 visual effect artists began work on the trilogy, and the number doubled by The Two Towers. The crew, led by Jim Rygiel and Randy Cook, worked long hours, often overnight, to produce special effects within a short space of time. Jackson's active imagination was a driving force. For example, several major shots of Helm's Deep were produced within the last six weeks of post-production of The Two Towers, and the same happened again within the last six weeks on The Return of the King. Each film had the benefit of a full year of post-production time before its respective December release, often finishing in OctoberNovember, with the crew immediately going to work on the next film. In the later part of this period, Jackson would move to London to supervise the scoring and continue editing, while having a computer feed for discussions to The Dorchester Hotel, and a "fat pipe" of Internet connections from Pinewood Studios to look at the special effects. He had a Polycom video link and 5.1 surround sound to organise meetings, and listen to new music and sound effects generally wherever he was. To avoid pressure, Jackson hired a different editor for each film. John Gilbert worked on the first film, Mike Horton and Jabez Olssen on the second and longtime Jackson collaborator Jamie Selkirk and Annie Collins on the third. In total, six million feet of film (over 1,100 miles) was edited down to the 11 hours and 23 minutes (683 minutes) of Extended running time. This was the final area of shaping of the films, when Jackson realised that sometimes the best scripting could be redundant on screen, as he picked apart scenes every day from multiple takes. Editing on the first film was relatively easygoing, with Jackson coming up with the concept of an Extended Edition later on, although after a screening to New Line they had to re-edit the beginning for a prologue. The Two Towers was always acknowledged by the crew as the most difficult film to make, as "it had no beginning or end", and had the additional problem of inter-cutting storylines appropriately. 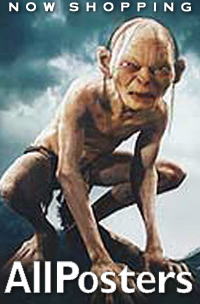 Jackson even continued editing the film when that part of the schedule officially ended, resulting in some scenes, including the reforging of Andúril, Gollum's back-story, and Saruman's demise, being moved to The Return of the King. Later, Saruman's demise was controversially cut from the cinema edition (but included in the extended edition) when Jackson felt it was not starting the third film effectively enough. As with all parts of the third film's post-production, editing was very chaotic. The first time Jackson actually saw the completed film was at the Wellington premiere. Many filmed scenes remain unused, even in the Extended Editions. Promotional material for The Fellowship of the Ring contained an attack by Orcs from Moria on Lothlórien after the Fellowship leaves Moria, replaced with a more suspenseful entrance for the Fellowship. Also cut were scenes from the book, including Frodo seeing more of Middle-earth at Parth Galen and an extended Council of Elrond, and new scenes with an attack upon Frodo and Sam at the river Anduin by an Uruk-hai. The major cut to The Two Towers featured Arwen and Elrond visiting Galadriel at Lothlórien, with Arwen then leading the Elven reinforcements to Helm's Deep. This scene, and a flashback to Arwen and Aragorn's first meeting, was cut during a revision of the film's plot; the Elves' appearance was explained with a telepathic communication between Elrond and Galadriel. Éowyn was to have a greater role in defending the refugees in the Glittering Caves from Uruk-hai intruders, while in Osgiliath, Faramir was to have a vision of Frodo becoming like Gollum, with Frodo and Sam having an extended fight sequence. Filmed for The Return of the King were two scenes present in the book; Sam using the Phial of Galadriel to pass the Watchers at Cirith Ungol, and further epilogue footage, with endings for Legolas and Gimli, Éowyn and Faramir's wedding and Aragorn's death and funeral. Sauron was to fight Aragon at the Black Gate, but with Jackson deciding the scene was inappropriate, a computer-generated Troll was used instead. To give context for Wormtongue killing Saruman, and Legolas in turn killing Wormtongue, it was to be revealed Wormtongue poisoned Théodred. 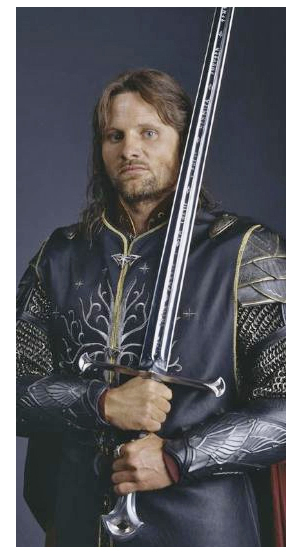 The final scene cut was Aragorn having his armour fitted for the Battle of the Black Gate by the trilogy's armourers, which was the final scene filmed during principal photography. Peter Jackson has stated that he would like to include some of these unused scenes in a future "Ultimate Edition" home video release, also including out-takes. After the success of the Lord of the Rings trilogy Peter Jackson would go on to make his version of King Kong and revisit the world of J. R. R. Tolkien with a two part film based on the Hobbit.